Egypt, Romano-Egyptian period, ca. 2nd century CE. A haunting portrait expertly-sculpted from stucco depicting an elegant woman with a slender neck line and an aristocratic profile in high relief. Her painted almond-shaped eyes boast elongated corners and define the serene nature of her countenance along with a slender, aquiline nose, rounded cheeks, thin lips, and a curved chin. 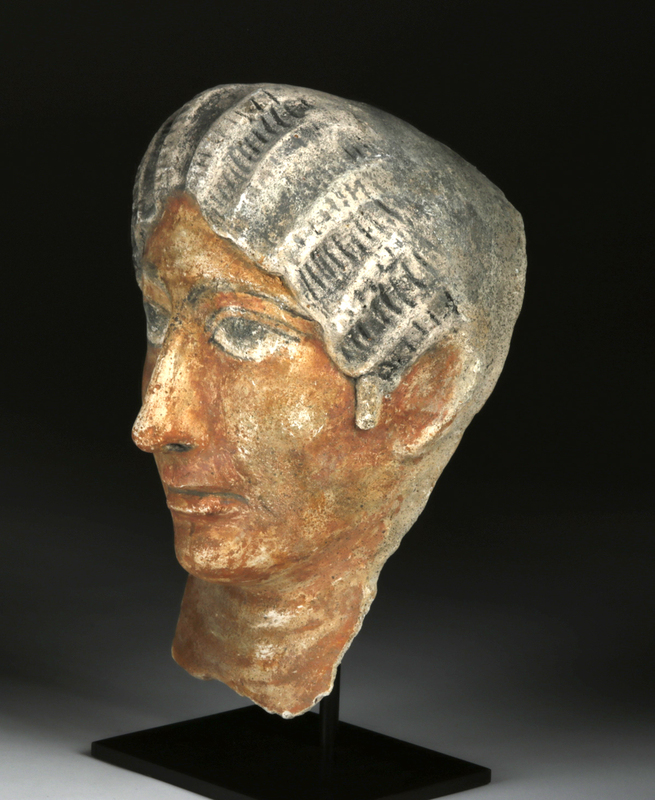 In addition, the wavy presentation of her coiffure resonates with contemporary Graeco-Roman stylization which arose following the conquest of Egypt by the Roman Empire. Hence, we see a more illusionistic approach in this funerary sculpture. Custom museum-quality display stand included. Size: 6.5" W x 9" H (16.5 cm x 22.9 cm); 11.4" H (29 cm) on included custom stand. 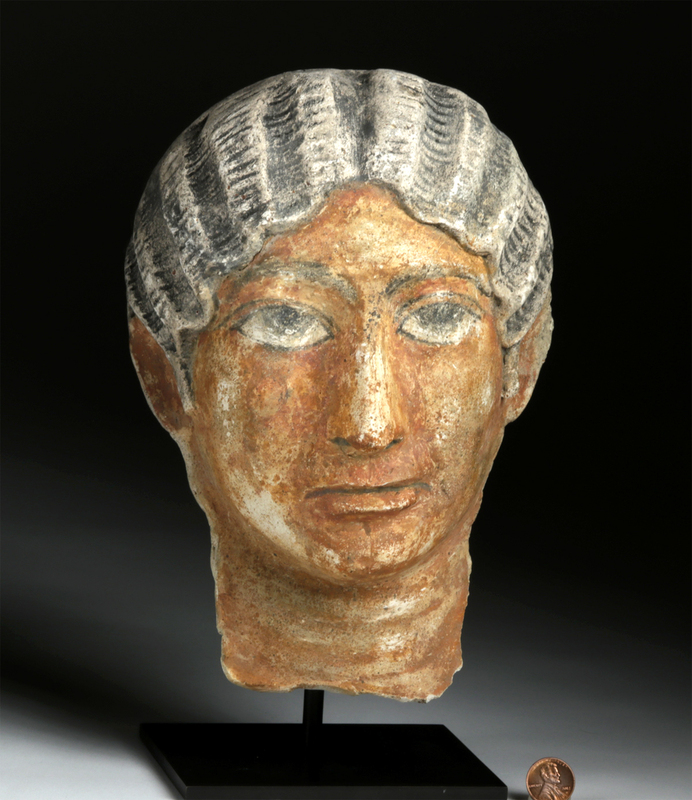 Heads like this one reflect the profound change that the Greco-Roman world brought to Egypt. The naturalistic depiction of a person's face as either a mask or head replaced the stylized art of dynastic Egypt; hieroglyphs and other symbols painted on elaborate sarcophagi fell out of favor, and a head like this would have been a memorial alongside a simple wooden coffin. 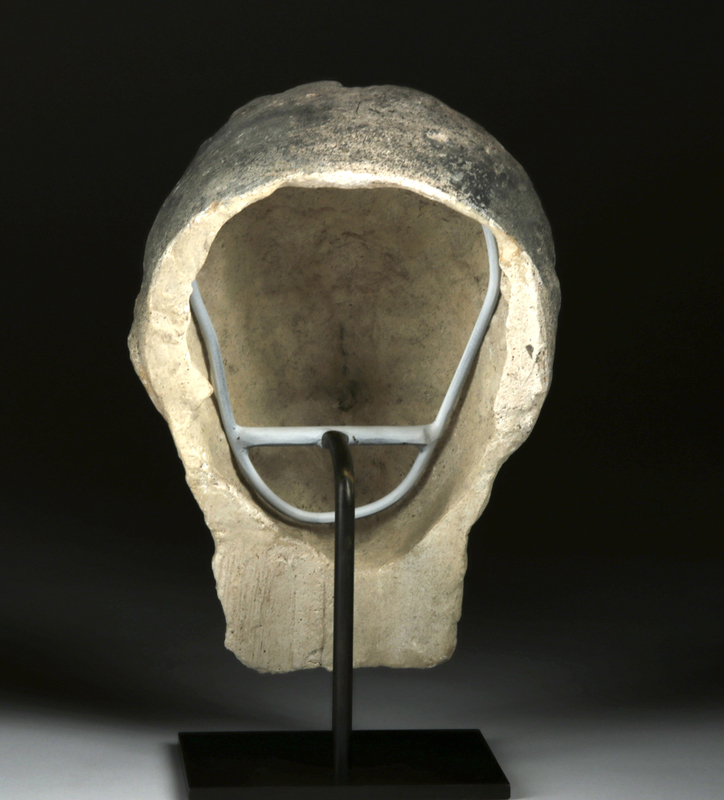 These heads were reserved for the elite, who were buried in small chapels, usually mummified and with other members of their family and/or town. 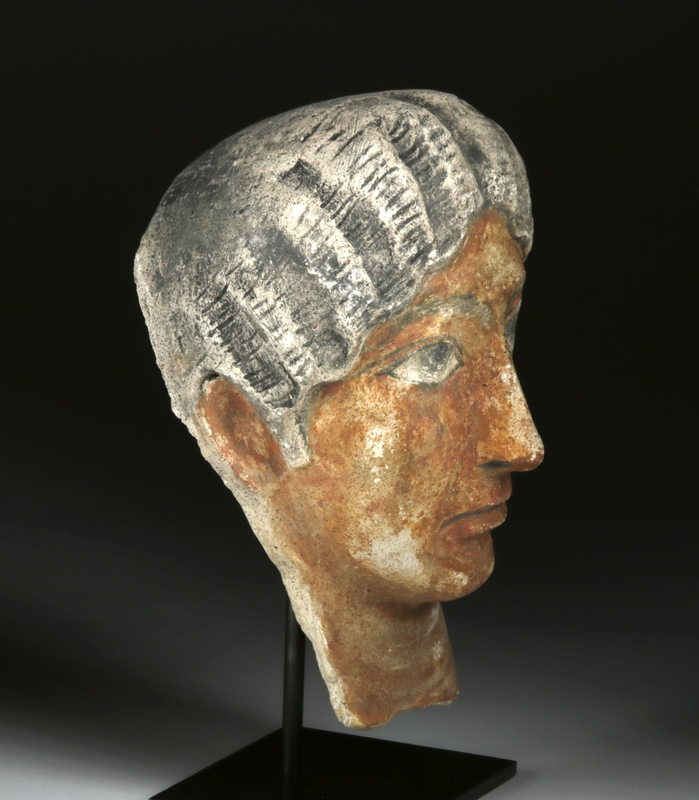 Funerary heads like this represented a dramatic change, departing from centuries of tradition. For the first time in the Roman period, Egyptian mummies were buried with lifelike representations rather than the mummiform masks seen in previous periods. Condition: Repaired from multiple large pieces with resurfacing and overpainting along break lines. Minor abrasions and nicks to hair, face, and neck line, with fading to areas of original pigmentation, and wear to some high-point areas commensurate with age. Light earthen deposits and nice traces of original pigmentation throughout.